Ginny Davenport, 100, enjoys a chat with her daughters Kelly Davenport (center) and Riley Davenport (left). 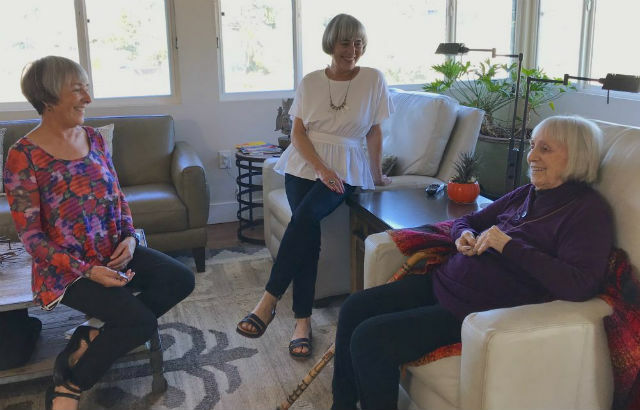 The daughters are part of a growing trend of older adults caring for their elderly parents. Photo by Amita Sharma / KPBS. It’s 3 p.m. on a windy February day in San Diego, and 100-year-old Ginny Davenport—with her easy smile and flawless manicure—is excited about the evening ahead. “I hope about five o’clock, before the girls leave, that we’ll sit down and have a vermouth,” she said. The girls, as Ginny calls them, are her daughters: 69-year-old Kelly and 67-year-old Riley. Both sisters are married. Riley is retired and Kelly is semi-retired. They have children. Kelly has a grandchild. At a time in life when 60- or 70-something seniors anticipate retirement, and maybe some downtime, some are becoming caregivers and guardians of their parents. No stats exist on how widespread this is, but the trend is expected to intensify. Caregiving by younger seniors amid their own aging issues has its costs. “For family caregivers, almost 50 percent report some type of strain or symptoms of depression,” Benton said. Riley Davenport said for her family, resources and planning have been key in taking care of her mom while maintaining the freedom of retirement. “We do have caregivers during the day so that I can work or play or do whatever I am going to do,” Riley said. Ginny’s older daughter, Kelly Davenport, said the sisters considered moving their mom to a senior community. “But I think that just neither of us can imagine that it would be the best thing for her, or us really,” she said. And she has lived fully. Kelly said Ginny got to hang around Winston Churchill after she joined the United States Foreign Service and worked for former U.S. Ambassador John Winant. Today, Ginny reads novels about that era. She’s been re-reading “Outlander,” the romance about a time-traveling World War II nurse, and watching “The Golden Girls” on television. And she talks with her daughters about her life and their lives. This article is part of The California Dream project, a statewide nonprofit media collaboration focused on issues of economic opportunity, quality-of-life, and the future of the California Dream. Partner organizations include CALmatters, Capital Public Radio, KPBS, KPCC, and KQED with support provided by the Corporation for Public Broadcasting and the James Irvine Foundation. Share your California dream. On Twitter, use the hashtag #CADream, or join the conversation on our California Dream Facebook group. Read More California Dream articles.